Tired of the same old square "shoe box" light fixture common at tennis facilities? If so, Lee Tennis, exclusive distributor of Tennis Optics Sports Lighting, has a new dynamic alternative: the Aerolume System. The Aerolume's aerodynamically styled housing and ballast compartment is constructed of die-cast aluminum for superior strength and durability. In addition, Aerolume's optics are precision-segmented to produce highly uniform light distribution coupled with sharp light cut-off, so they illuminates your court and not the surrounding neighborhood. The system can be mounted on either a round pole and davit arm or square pole and artistically inspired curved arm. With ICA's TurboCaindle®, you'll see your game in a whole new light. It provides more uniform, glare-free lighting output per fixture than other indirect fixtures. More light output per fixture means fewer fixtures are needed to achieve optimal illumination on the courts. Fewer fixtures means lower utility bills. TurboCaindle® produces ultra-pure indirect lighting. 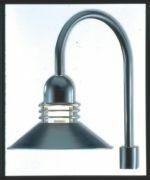 The housing is made of durable, impact-resistant spun-steel, and the bulbs are long-lasting 1,000-watt metal halide. 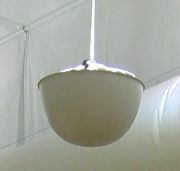 The pendant-mounted design allows for easy installation. Maintenance, cleaning and re-lamping are also easy, and the units are economically priced. Control-Link® is a reliable, cost-effective system that helps you control, monitor and manage your recreational facility lighting and other equipment like doors, gates and security lighting. Flexible control, reduced energy costs and usage reports provide a basis for significant long-term cost savings and the potential for providing better customer service, as well as innovative use of your facilities without adding staff. The system includes on-site control, monitoring and switching equipment, an Internet-based communication system, an industry-leading warranty, and the exclusive Control-Link CentralTM , staffed 24/7 to assist in scheduling and reporting needs. Techline helps level the playing field when it comes to high-quality, affordable sports lighting for your outdoor recreational facility. Techline can provide some of the best products and service in the industry at a reasonable cost because the company has one single focus: sports lighting. No matter what your needs are, Techline can help light the way with lighting for football, baseball, soccer and softball fields, tennis courts, driving ranges, golf courses, motor sports complexes, and rodeo arenas. The Helos family of lighting fixtures from Luraline Products Company features a classic industrial design in a coordinated collection of pendant, ceiling, wall and post mount configurations. Helos is offered with a choice of incandescent or energy-efficient compact fluorescent or HID lamping. A full palette of painted and metallic finishes is available, as well as custom colors on request. 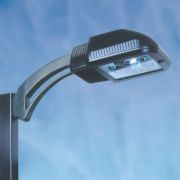 All fixtures in the series are suitable for interior or exterior applications. Qualite® has designed a variety of outdoor lighting systems that meet the varying needs of sports facilities. The company's International, Gold and Pro-Series offer custom choices for individual field applications, with maximum control of light trespass in the surrounding area. All Qualite® systems are pre-assembled and pre-aimed with factory wired lighting assemblies for easy installation. Remote ballasts are standard, reducing weight at the top of the pole. Equipped with Qualite®'s exclusive Maintenance Diagnostic System to simplify maintenance, the systems allow you to make circuit checks from the bottom of the pole with the power safely turned off. Daft's patented Hanglite System of indirect lighting can be installed in any air-supported fabric or conventional structure with an interior reflective fabric liner. The system is capable of producing up to 100 percent more lighting than other types of lighting, while reducing lighting bills by as much as 30 percent. This unique, state-of-the-art system can flood your entire structure with professional-level, evenly distributed lighting without glare, hot-spots, shadows or dark corners.